399 Park Avenue is a 41-story office building that is the world headquarters of Citigroup in New York City, United States. 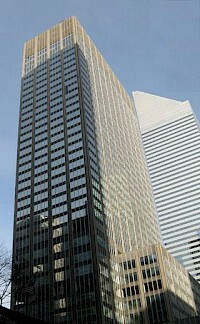 Citigroup's chairman and chief executive officer operate from the building's second floor. The company moved to the building from 55 Wall Street; a move which marked a migration of several large banks from downtown to midtown Manhattan. It occupies the entire block between Park Avenue and Lexington Avenue and 53rd Street and 54th Street.